As of May 2012, this dial was removed from display by museum staff. Bronze equatorial dial 20, inches in diameter. The dial is outlined by an ornate ring tilted in the plane of the polar axis with extending flames representing the sun. A gnomon rod bisects this ring. 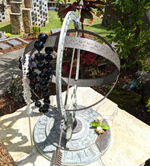 The dial base is a statue of the Hawaiian mythological figure Maui snaring the sun, Kala, with ropes to snare the sun. The dial itself is a semicircular portion of an equatorial ring with inscribed hour lines and raised Roman numerals. The dial has been exhibited in various museums in San Diego, San Francisco, Seattle and Vancouver before permanent installation at the Bishop Museum in Honolulu. Gnomon and equatorial ring appear misaligned for 21 degree latitude. The museum is will correct the dial in the near future.